Crossing guards stationed outside the Bend Police and Municipal Court building assisted a slow but steady stream of visitors as they made their way across NE 15th Street from the parking lot by Lava Lanes. Inside the courtroom, a sea of neon green and orange clad concerned citizens packed into the room, standing along the edges when the more than 100 chairs filled up. It was a busy scene for a Tuesday morning, but the planned expansion of OSU-Cascades has reignited as a hot topic, enough so that anyone in the crowd not yet retired felt it worth taking some time off work. 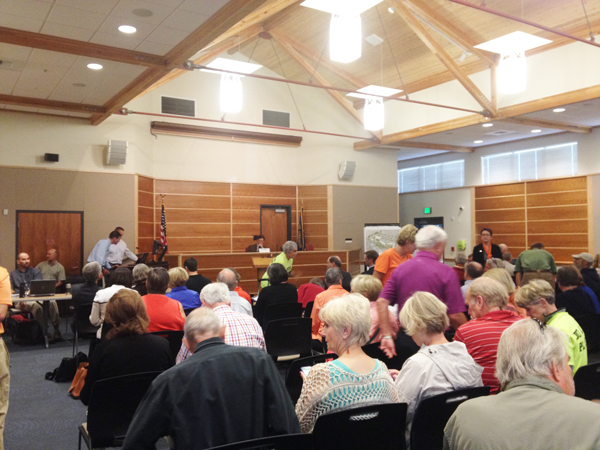 The result: a standing room only crowd that sat through two days and seven hours of testimony on June 11 and 12 in the ongoing debate over OSU-Cascades’ proposed westside campus. Deschutes County Hearings Officer Ken Helm heard testimony from dozens in support and opposition, as well as from lawyers and other officials speaking to the more technical aspects. About 20 of those opposed wore neon green T-shirts that read “Choose the right site” on the front and “Do all the planning” on the back. A similar number of OSU supporters wore orange or small college pins, though Matt Shinderman, co-chair of the OSU-Cascades Campus Expansion Advisory Committee, says there was no request made by college officials to do so. In the hearings, which were intended to address whether OSU Cascades’ plans for the 10-acre site off SW Century Drive meet the relevant city codes, about 40 people from each side offered testimony. Bend City Planner Aaron Henson testified that he had additionally received more than 200 comment letters expressing a variety of perspectives. While the hearings officer is not ruling on the site’s location—but rather the site plan and city code pertaining to traffic and parking—opponents of the project still hope their efforts will lead to a change in site. Primary among the group’s concerns is that the college isn’t planning for enough parking, and that it has underestimated the impact the influx of students, faculty and staff will have on parking in the Century West neighborhood. Morgan says the school’s plan to have about 300 parking spots is “significantly inadequate,” adding that, by his interpretation of the universal building codes, the college needs closer to 750 for the 1,900 students it hopes to attract in its first year. He also says OSU’s traffic impact study was conducted during a particularly low traffic time and is not representative. Henson explained at the hearing that OSU expects about 702 seats to be in use on campus at any one time. Of those students, the college is anticipating 379 will use a non-auto mode of transportation. With the approximately 300 students living on campus not allowed to bring a car, Henson said OSU estimates it will only need about 279 parking spots for cars, though they are planning for a few more than that. The plan also includes 316 bicycle parking spots. In terms of traffic, Henson said that the study is anticipating 284-571 peak hour trips, which is a difference of 26 trips from the initial estimate from that area. OSU’s Shinderman says he believes some of the concerns around parking and transportation impacts are due to generational differences. “Many of the folks who are skeptical are drawing from their experience as students where multimodal transport is not the norm,” he explains. Millenials, he argues, have been shown to be more inclined to walk, bike and use public transportation. While the college intends to provide the amount of parking necessary, Shinderman says that opponents don’t seem to know what they want. Moreover, opponents claim the college is engaging in bait-and-switch tactics by seeking approval for the 10-acre site when they ultimately plan to grow to 56 acres. Ultimately, it may not matter, as Truth in Site has not laid out any conditions under which its members would accept a westside campus. The hearing remains open for public comment until 4 pm June 25 via osucomments@bendoregon.gov. Following this initial comment period, the city will accept arguments and evidence in response to the information submitted in the first two weeks. Then, OSU-Cascades gets a week to make final statements before the hearings officer issues a ruling in August.